This article requires WP Job Manager - Stats to be installed and activated. As a site owner, you have the option of toggling listing page stats so they are visible for paid listings only. For example, if you have “Gold”, “Silver” and “Bronze” listing packages (each with different features, and therefore different prices), you could set stats to be available to “Gold” package listing owners only. This gives your top-tier listing packages more value, and your listing owners more features. 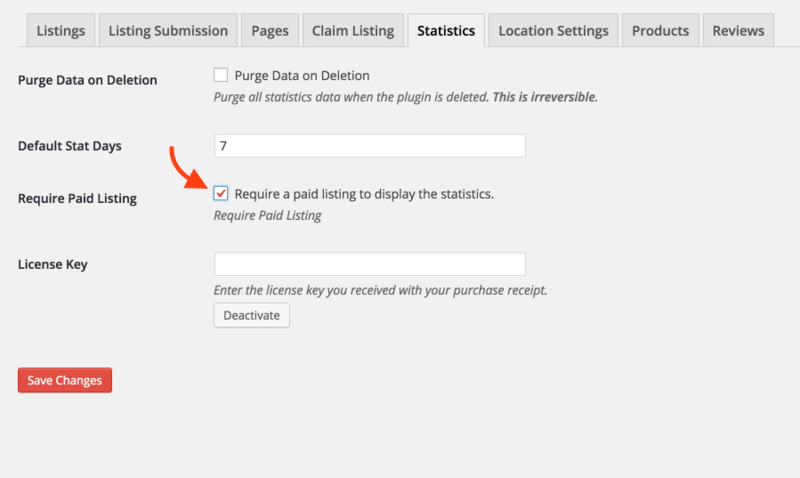 If you wish to enable this feature visit the settings area of the Stats plugin (This feature requires Paid Listings to be installed). Select the option called "Require Paid Listing". To limit access to stats for a particular paid listing package visit Products > Edit a package you have previously created > You will see a new option inside of the Product Data window called "Display statistics" select this option to limit access to stats to this paid listing package. Now only listing owners who have subscribed to this listing package will have access to stats for their listing.